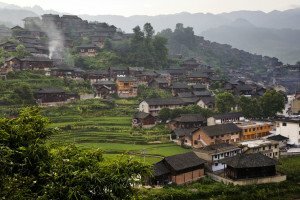 China’s poorest province, Guizhou is slightly smaller than Cambodia and Uruguay, spanning a total area of around 176,000km2. Located in the country’s south-west, Guizhou is bordered by Sichuan to the north, Hunan to the east, Guangxi to the south, and Yunnan to the west. Its capital, Guiyang, is located in the province’s center. A famous saying about the region is that there are “no three days without rain, no three hectares without a mountain, and no three coins in any pocket.” Guizhou officially became a Chinese province during the Ming Dynasty when the Imperial Court used its more formal integration into the empire as a way to pacify the large Yao and Miao minorities living in the area. When the Nationalists made Chongqing the capital of China during the 1937-1945 Sino-Japanese War, Guizhou was linked with the Burma Road, and its transportation infrastructure improved. After Mao came to power in 1949, he relocated some heavy industry to Guizhou to shield it from a potential Soviet or American attack. 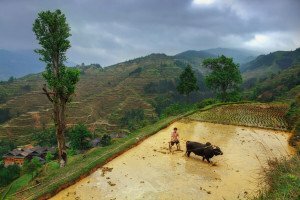 Since China’s 1978 market opening, however, investment in Guizhou has tailed off, and the province’s growth rate has lagged most of the rest of China. There are few cities in Guizhou. Its population of 35 million is primarily rural, and highly diverse. At 2.19, Guizhou has China’s highest birth rate in China. About 60% of its people are Han. The remaining 40% are comprised of more than 40 ethnic minority groups including the Miao, the Dong, the Buyi, the Yi, the Shui, the Yao, and the Zhuang peoples. 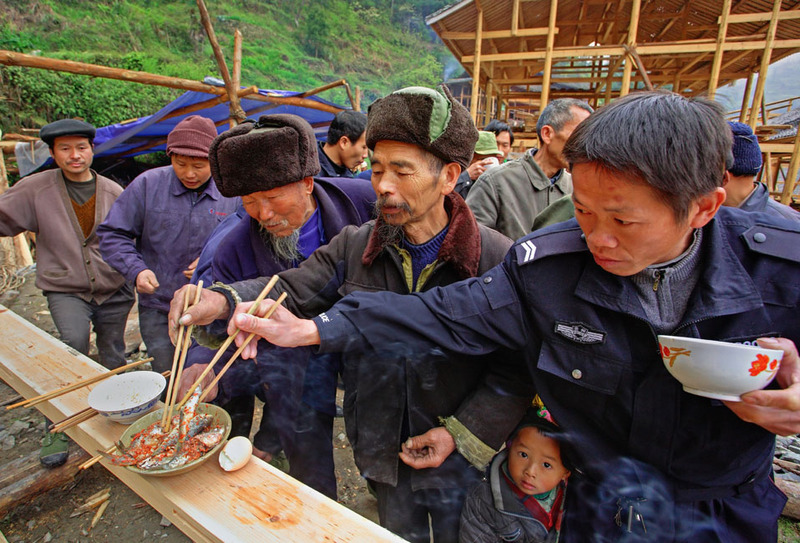 Guizhou is one of the most disadvantaged and poverty stricken areas of China. With an annual GDP of only around $151 billion, it has the lowest per capita GDP in all of China. Guizhou’s economy is almost purely agricultural. 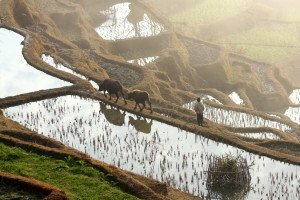 Rice is the region’s most important crop followed by corn, wheat, barley, potatoes, oats and broad beans. Other commercial crops cultivated include rapeseed, tobacco, peanuts, sugarcane, jute, tea, sugar beets, hemp, and sesame. It also known for its production of timber, raw lacquer, tung oil, camellia oil and cypress oil. Guizhou is rich in mineral resources and its extractive industry is a large contributor to its economy. Guizhou mines mercury as well as manganese, zinc, lead, aluminum, copper, iron and gold. Its nonmetallic mined natural resources include coal, oil shale, phosphate, gypsum, arsenic, limestone, and fluorite. Guizhou is also a large power producer through both coal plants and hydropower, and exports its significant surplus to Guangdong. Although industry is not a major part of Guizhou’s economy, it still plays a very significant role, with chemical and chemical fertilizer production, mining, steel, steel-making and agricultural machinery production, paper, winemaking, textile, leather, and silk being its main industries. Its capital Guiyang is its most important industrial center. Guizhou lays on top of the Yunnan-Guizhou Plateau, which gradually ascends as it moves west from about 700 meters in Guizhou’s eastern regions to about 2,000 meters in Guizhou’s west. The plateau is mainly comprised of limestone and basalt, has undergone much change from geological process such as water erosion so that sharply cut valleys, deep gorges, high cliffs, karst formations, and dramatic waterfalls – such as the famous Huangguoshu Waterfall in the Guizhou’s southwest- are a frequent sight in its very mountainous landscape. There are several mountain ranges in Guizhou including the Dalou Mountains in the north which form the border between Guizhou and Sichuan. The Wuling Mountains in the northeast, renowned for their biological diversity has been named a World Heritage Site. The Miaoling Mountains in Guizhou’s center act as a watershed between the Yangtze River and the Pearl River. Most of Guizhou’s rivers run upstream from Yangtze and the Xi and include the Wujiang, the Qingshui, the NanPan, the Chishuihe, and the Beipan. All these rivers increasingly narrow as they move downstream flowing either north, east, and south depending on the gradient that they are following. Their hydroelectric potential comes from their rapid currents and waterfalls that happen as the rivers narrow. As its saying suggest, the province enjoys little sunshine. The capital Guiyang, for instance, has more than 260 cloudy or rainy days each year. 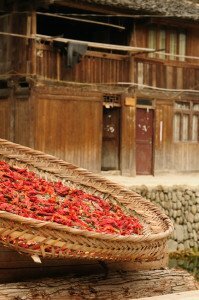 Visitors should prepare themselves for some of China’s spiciest food; Guizhou people boast that although “Sichuan people are not afraid of spicy food, Guizhou people are afraid of food that is not spicy”. 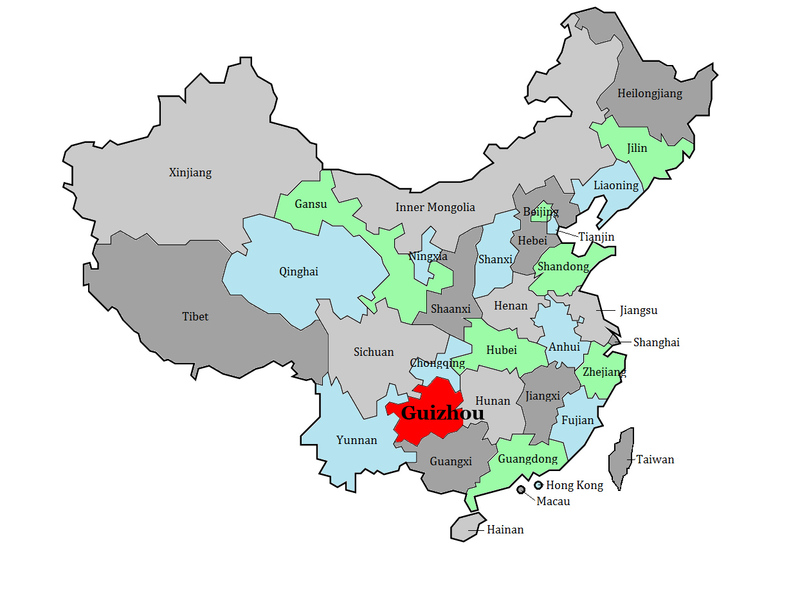 Guizhou is equally renowned within China as the home of Moutai (Maotai), China’s most famous liquor. Though not to the taste of many westerners, it is exported to more than 100 countries but, at 53% abv, it is not for the faint hearted. A visit to Guizhou usually begins at Guiyang, the capital’s province. 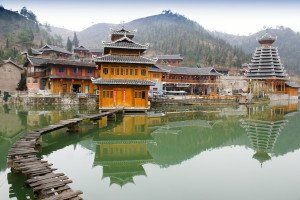 Guiyang boasts several temples and pavillions including the famous Jiaxiu Pavillion, the Ming-era Cuiwei Gongyuan temple, Wenchang Pavillion and the 17th century Hongfu Temple- reached either by cable car or by hiking up Qianling Mountain. Qianling Park, a massive park which takes its name from Qianling Mountain, has been labeled an AAAA National Tourist Attraction. As well as the mountain and temple, its other sites include the Macaque Garden, Kylin Cave, the Qianling Zoo and Qianlin Lake. Kali, 195 km east of Guiyang, is a good place to visit a number of the Miao minority villages dotting surrounding rural landscape including Xijiang, Langde, Leishan, Shiqiao, Matang, Longli, Basha and Zhaoxing, all of which have their own character, traditional architecture, and host excellent markets where silver, embroidery, musical instruments and other local handicrafts can be purchased. Just 30 kilometers south of Guiyang is the Ming-era, walled-town of Qingyan which has a Catholic Church as well as Buddhistand Daoist temples, and provides an atmospheric change from the bustle of Guiyang. The Huangguoshu Waterfall, in western Guizhou, is one of the largest waterfalls in China at 77.8m tall and 81m wide. Behind the Huangguoshu Waterfall is the “Water-Curtain Cave”, where the massive waterfall can be experienced from a completely different angle. Huangguoshu Waterfall is a part of an extensive geological karst complex formed by having water wear away at the limestone underneath; sightseeing cars connect other geological features of this complex including the smaller Doupotang and Luositan Waterfalls. Close to these waterfalls are the massive Longgong and Zhijin Caves. At 10 km long and 150m high, Zhijin Cave, for instance, is the one of the biggest caves in the world, and the largest in China. Several local villages around the waterfall are also worth a visit including Ming-era Tianlong, charming Yunshan and historic Benzhai. Weining, a seven hour drive from Guiyang, is renowned for its Caohai Lake, one of the world’s best spots for bird watching. 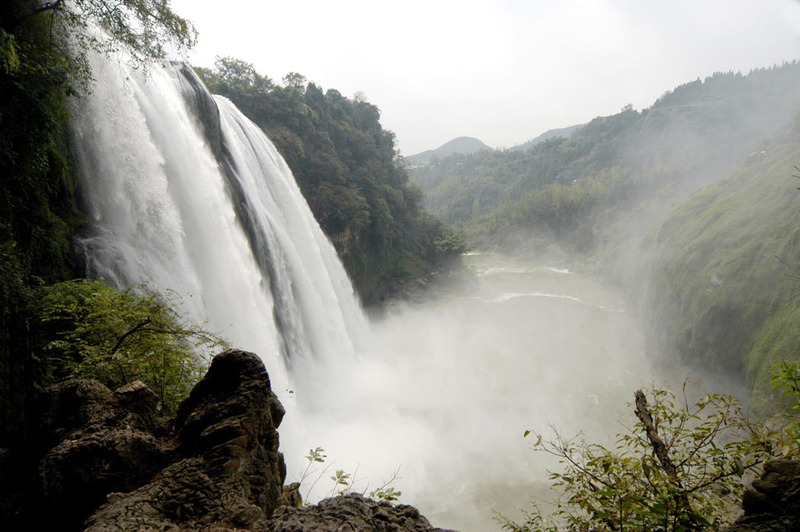 The north of Guizhou is visited most for its natural features including the Shizhangdong Waterfall, which is just a meter shorter than the much more famous Huangguoshu Waterfall. Other natural sights include Yanzuyan National Forest Park, known for its red rock formations, and the Jinshagou Nature Reserve which makes a home for the surrounding bamboo forest and indigenous alsophila ferns.